Leonard Mennie, 91, of Ottawa, died on Monday evening, February 4, 2019 at the Ottawa Pavilion, surrounded by his family. Funeral services will be private. Interment will be at the Shrine of Rest Mausoleum at Oakwood Memorial Park. Arrangements have been entrusted to the Mueller Funeral Home in Ottawa. Leonard was born on April 20, 1927 in Ottawa to John and Bessie (Halterman) Mennie. He worked for Libbey-Owens Ford for 41 years. Leonard served in Army during World War II. He married June Charlier on June 18, 1951 at St. Patrick’s Church in Ottawa. 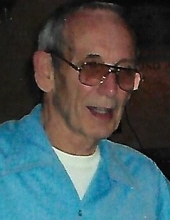 Leonard was a member of St. Patrick’s Church and a lifelong member of the Moose Lodge. He is survived by his wife, June, a son, Keith Mennie, of Ottawa, and a sister, Joan Harvey, of Ottawa. He was preceded in death by his parents, 4 brothers, Hubert, John, Jim, and Vernon Mennie, and 3 sisters, Ruby Lietz, Alice Downey, and Delores Tabor. Memorials may be directed to the family. To send flowers or a remembrance gift to the family of Leonard Mennie, please visit our Tribute Store. "Email Address" would like to share the life celebration of Leonard Mennie. Click on the "link" to go to share a favorite memory or leave a condolence message for the family.